By John D. O’Brien, S.J. Pope Francis continues his juggernaut of simple speeches that strike home and make headlines. Earlier this week, in a homily in the Domus Sanctae Marthae where he lives, he said that if we want to follow Jesus we have to get rid of a culture based on economic well-being and lose our attraction to the “provisional.” These two points strike home prophetically and poignantly, as they seem to be precisely what we prize more and more. The remarks were based on the well-known Gospel story of the young man who goes away sad after Jesus asks him to give away his possessions and follow him. “Riches are an impediment,” the Pope said, that “do not facilitate our journey towards the Kingdom of God”. He did not let us off pointing fingers at the materially rich: “Each and every one of us has riches,” he said, something that “stops us from getting close to Jesus”. We must identify these by name by thorough and rigorous examination of conscience. Yes, yes, we know all this, one might be tempted to say. But what does Pope Francis single out for our attention? He focuses on two unusual “cultural riches”: the first, a “culture of economic well-being that causes us to be lacking in courage, makes us lazy, makes us selfish”. Well-being, he said, “anaesthetizes us, it’s an anaesthetic”. The other is our attachment to the temporary. Well-being (the Italian word is benessere) is a popular word, but it is not a Gospel word. This may throw us for a loop, since from birth we are trained to pursue our own “well-being.” It may result in an ersatz Christianity, a spiritual religion that closely resembles the real thing, but which is really just spiritual therapy, a “what works for me.” Jesus offers us peace, joy and consolation, to be sure, but it is only as an aftereffect of other commitments that include acts of faith, renouncing sin and even being a folly to the world. Jesus asks us to be ready to give the whole sorry game up, and embrace a following that is, quite frankly, absolute. It is the one thing necessary. And so the uncompromising directness of his words still strike us today: it is simpler for camel to go through the eye of needle than for a “rich man” to enter the kingdom (whether he meant a literal needle or the portico in Jerusalem is not important). The apostles gasped in astonishment. Who then, can be saved? Since not everyone was rich, they must have understood whom the message was about: those who pursue the goal of economic well-being over … what? Giving it away to the poor and following me. How do these attachments take place today? No, no, not more than one child, because otherwise we will not be able to go on holiday, we will not be able to go out, we will not be able to buy a house. It’s all very well to follow the Lord, but only up to a certain point. This is what economic well-being does to us: we all know what well-being is, but it deprives us of courage, of the courage we need to get close to Jesus. This is the first richness of the culture of today, the culture of economic well-being. He is the Lord of time; we are the masters of the moment. Why? Because we are in command of the moment: I will follow the Lord up to this point, and then I will see … I heard of a man who wanted to become a priest – but only for ten years, not any longer … Attraction to the provisional: this is a richness. We want to become masters of time, we live for the moment. We are often afraid – and I count myself in this number – to follow beyond what is comfortable and controllable. Yet the fleshy, non-spiritualized reality of Christianity does not permit such half-steps. As one Jesuit colleague of mine remarked in his review of the Malick film To the Wonder, “any substantive talk about the Holy Spirit must be grounded in carnal experience, if it is to be authentic to the full breath of the tradition and relevant to the world.” We must incarnate our love and following of Christ with deeds of sacrifice and action. What kind of saint is needed today? Who does the world await to remind it of its own calling? - Our Lord's words came to mind as I was reading yours, "My kingdom is not of this world" ... reminding us that there are riches more worthy of seeking than economic and provisional ones. 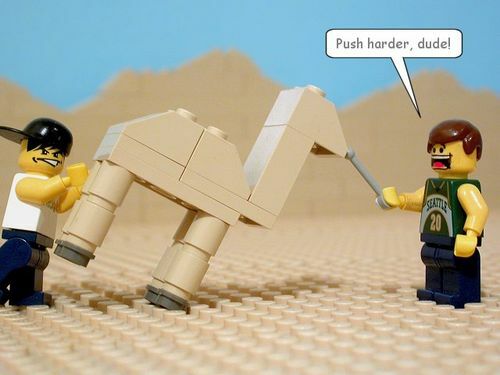 - Love the little LEGO guys in the comic - so funny ... cute!... don't push or prod any more or it's going to all fall apart! Perhaps the devil was there to ever trick us into doing ridiculous and foolish things - contradicting ourselves - making it difficult to achieve a fine balance ... it can sometimes be a sorry game, can't it?